Anpan-man is a Japanese cartoon character who has been a favorite of local kids since his introduction in 1969. ‘An’ means red bean and ‘pan’ means bread in Japanese. His head is made of anpan (red bean bread), and he loves to give a piece of his head to people who need help or are hungry. 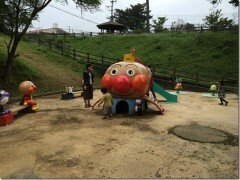 The park is not that big, and it doesn’t have a sandbox, however, it has Anpan-man theme playground equipment and characters.